Piccadilly Cafeteria menu prices page. Delicious food is what Piccadilly Cafeteria has to offer to its customers. If you are a first timer, it’s advisable that you go for its Fried Chicken and Carrot Souffle. Apart from the wonderful menu, it boasts of courteous and fast service, and affordable prices. Indeed, there is something that every customer will love at Piccadilly Cafeteria. Piccadilly offers discounts to military personnel, seniors, and kids. Some locations offer all-you-can-eat breakfast. To stay on top of current promotions or new menu items, sign up for the Piccadilly email newsletter or you can connect with Piccadilly through social media. Meals include entree, two sides and bread. You have almost limitless choices of chicken and meat at Piccadilly – surely, you’ll enjoy checking out its many menu items. Popular is Blackened Chicken Breast, which is breast part that is flavored with Cajun spices and grilled just right. What’s surprising is that prices are low, and so everything is affordable. They even have specials and promotions that make reasonable prices even lower. For example, there is the Kids Days Special priced at $1.99, in which parents can buy their little tots delicious entrees like chicken tenders, spaghetti and meat sauce, roast beef, fried chicken legs, and many more. The promotional meal comes with two sides and a kiddie drink. Piccadilly Cafeteria also offers Weekend Breakfast Buffet where a diner has choices of waffles, egg omelets, sausages, juices and so much more for just $7.29. It was in 1932 when the very first Piccadilly Cafeteria establishment opened in Louisiana. More than ten years later, T. H. Hamilton took over the ownership with grand plans of making the restaurant one of the finest within this area of the state. He did succeed, as today Piccadilly comprises sixty restaurants and eighty food services in all of the southeast. 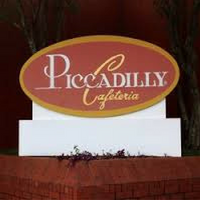 For more information about Piccadilly Cafeteria, visit their official website. If you desire to increase your familiarity simply keep visiting this web site and be updated with the most recent news posted here. Who is doing your baking. Just bought some pie either sweet potato or pumpkin don’t know for sure. The spice and sugar so strong that you couldn’t tell. The stuffed fish was ok but not up to standards. I’ve been going to Piccadilly since my son and his wife were in college, now their children are in college. Not once have I complained but this was bad.